The DVD is called Malcolm Pryor on Short Term Spread Betting, the subsidiary title is Winning strategies for active traders. Here is a further description from the DVD container. In this DVD spread betting expert and bestselling author Malcolm Pryor exclusively reveals some of his successful trading strategies. 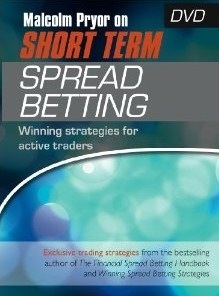 The focus of the two hour DVD, with its accompanying booklet, is on short term trading using spread bets. Short term in this case is defined as trades lasting just a few days. The DVD consists of sixteen video modules, with each group of modules introduced via a short presentation to camera. The first group of modules sets out the specific trading principles underlying the DVD. In the second and third groups of modules, two trading strategies are introduced, TDS and T+DS. The final modules offer practical thoughts on trading the strategies and on implementing the principles of the DVD.